'Minnebama', the Ralph Ladd Cutter residence built c. 1900 in Westhampton. Cutter was a partner in the dry goods firm of Smith, Hogg & Co. 'Minnebama' is no longer extant. Thanks Ancient. The Cutter's Brooklyn house makes an interesting comparison with their Long Island house. 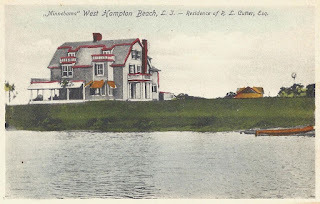 The Brooklyn house has "Flemish stepped gables on the roof line" while their house in Westhampton had a gambrel ("Dutch") roof. I wonder if it was coincidence or a specified theme ... not that it matters much now.